Satanic Temple Statue of Baphomet Appears at State Capital Protest – Zero Equals Two! “Members of the Satanic Temple used a statue of the occult deity Baphomet to protest a Ten Commandments monument in Little Rock, Ark. 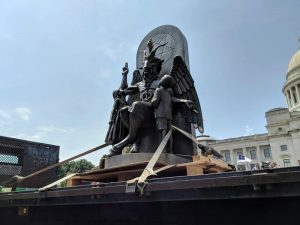 “The 8.5-foot-tall statue, which depicts the winged half-goat, half-man, with two children at its side, was briefly installed in front of the State Capitol building on Thursday as a symbol of free speech and plurality of beliefs, organizers told NPR. It was also meant to protest the explicitly Christian values promoted by a Ten Commandments monument on Capitol grounds, in keeping with the Satanic Temple’s belief that religious displays should not be placed on public property. PS the Washington Post coverage was kinda bullsh** with them describing Baphomet as a “demonic monster.” Sigh.